Look ma... I got FREE Countryside Chicken Soup and Iced Lemon Tea at Kenny Rogers ROASTERS (KRR). 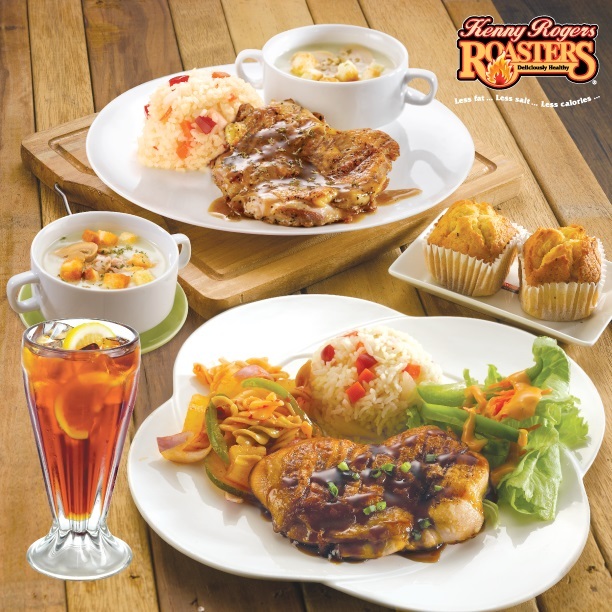 Are you fans of Kenny Rogers Roasters? Imagine the irresistible and succulent rotisserie roasted chicken, complemented by a wide variety of hot and cold side dishes and varieties of thirst quenching drinks. Summarize it in 2 words it’s delicious and healthy. 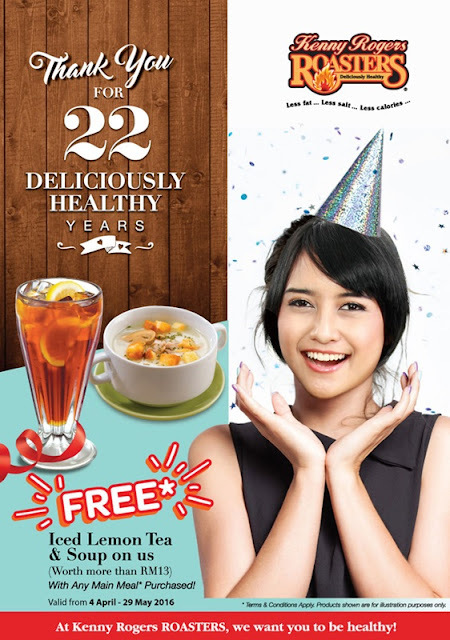 Hey I got some good news for all KRR fans here so continue to read and redeem KRR 22 Deliciously Healthy Years free vouchers yo! Hey do you know that the first KRR Malaysia outlet opened in Kuala Lumpur back in 1994. And this year KRR is celebrating its 22 Deliciously Healthy Years in Malaysia. Congratulations KRR Malaysia! and thanks for bringing so much joy and memories to us while we enjoy our healthy meals with family and friends. Oh! I have not get into my main point yet… Ok listen and take note. KRR would like to reward all of us in conjunction with their 22 Deliciously Healthy Years in Malaysia. We get FREE Countrystyle Chicken Soup and Iced Lemon Tea with any main meal purchased when we dine in any of KRR restaurants across Malaysia, from today onwards till 29th May 2016. All you need to do is download this e-voucher and present it when you order. Or alternative you can present your Facebook post share, vouchers, newspaper cut-outs or SMS upon placing your order at the restaurant. Or you can visit http://bit.ly/krrpromo to redeem your voucher. Here are some of the terms & conditions that you might want to take note. 1. Redemption from 4 April 2016 till 29 May 2016. 2. Valid for dine-in only. 3. Voucher is not exchangeable for cash. Please present voucher while ordering. 5. Valid at all Kenny Rogers ROASTERS in Malaysia only. Besides, KRR would like to share their delicious and healthy meals with the less fortunate too. For every 22 likes received on their Facebook post KRR will also contribute Kenny’s Quarter Lite Meal to selected charitable organizations. So nice one! Happy Birthday KRR! wow missed it so much. It's yummy! KRR chicken is always the yummiest! Been awhile since I went to KRR. Time to pay them a visit since now they got such a good deal. Always been a fan of Kenny Rogers ROASTERS. There is now even more reasons to dine there! So gonna print out the voucher and claim it soon! :D Thanks babe! This is so tempting. It has been quite some time since I last visited KRR. Love their muffins and now to get free soup and drink? I think it is high time for me to go dating there. Yummy and healthy meals, thanks for the evoucher, will use it together with the krr gift card that i received from the krr chicken run last sunday.